At the end of a four-game road trip and playing without Josh Hart and Brandon Ingram, the Los Angeles Lakers seemingly couldn’t get over the hump for much of the night but found enough in the fourth quarter to come away with a 116-112 victory. With that, the Lakers went undefeated on their road trip and extended their winning streak to a season-long five games. They fell behind by as many as 17 points but closed the final six minutes on a 25-9 run. Lonzo Ball was particularly instrumental over the final few minutes as he made a trio of 3-pointers. He finished the night with 18 points, seven rebounds and 11 assists. All of Ball’s points came from behind the arc, where he shot 6-for-10. The Lakers began the night 1-for-10 and almost immediately faced a double-digit deficit. They shot just 22.7 percent in the first quarter but only trailed 30-23. That in large part was due to Julius Randle making all six of his free throw attempts and Isaiah Thomas going 4-for-4. Along with poor shooting impacting the Lakers’ comeback efforts, Lonzo Ball and Randle each picked up three fouls in the first half. The Lakers nonetheless went on a 7-0 run to pull to within two points but allowed San Antonio to lead by seven at halftime. 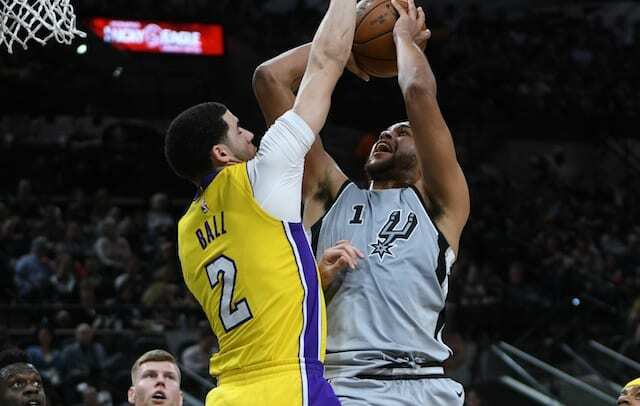 The Spurs’ lead grew to as many as 17 points in the third quarter, though they never quite managed to put the Lakers away. But with that, L.A. also didn’t help their cause. Kyle Kuzma had an opportunity to trim the Lakers’ deficit to six points with less than a minute remaining in the third, only to miss both free throws. The Spurs closed the quarter on a 5-2 run and took a 91-80 lead into the fourth. A Thomas jump shot cut the deficit to eight points early in the quarter, and after another Spurs’ surge, a pair of Travis Wear’s jumper and Kentavious Caldwell-Pope’s technical free throw made it a one-possession game. With an opportunity for the Lakers to tie it, Caldwell-Pope came up empty on a forced fadeaway. He compounded that by falling at halfcourt on a steal attempt, leading to a Tony Parker layup. But the Lakers kept chipping away before ultimately taking control. Randle scored a game-high 25 points, adding six rebounds and three assists. Wear seven points and two rebounds in 13 minutes of his Lakers debut.